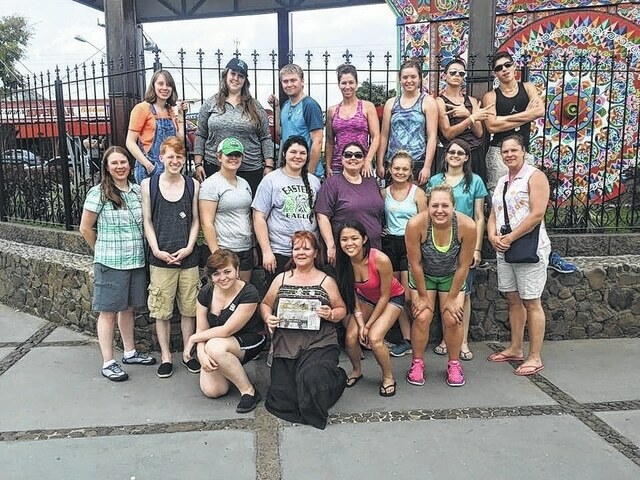 REEDSVILLE — Nineteen students, teachers and parents from Meigs and Athens counties joined the newly formed Southeast Ohio International Travel Club for an educational adventure tour of Costa Rica. Led by Education First Tours, the group circled from the capital city of San Jose to the volcanoes of the cloud forest, then traveled south to the white-sand beaches of the Pacific coast. The 10-day adventure included the Carara Biological Reserve and Manuel Antonio National Park. On Costa Rica’s Arbor Day, the travelers planted trees in the forest. For a service activity, the group visited an elementary school, taking along gifts and joining the children in dances and games. The travelers swam under La Fortuna waterfall and visited an active volcano, then took a well-deserved dip in Baldi Hot Springs. Daily activities included hiking, swimming, kayaking, horseback riding, zip lining, whitewater rafting, tours of coffee and cocoa plantations, and a visit to an oxcart factory in Sarchi, a city renowned for its artists. The Touch of the Tropics tour focuses on the rich diversity of wildlife and flora in Costa Rica. Numerous sightings of monkeys, snakes, lizards, and colorful birds and flowers exceeded the promises of the travel brochures. The Southeast Ohio International Travel Club – Learn Live Travel, plans to go to Spain in 2017. The group serves youth of Meigs and Athens counties, ages 15 to 18, along with teachers and parents who wish to travel abroad in an educational environment. For more infromation, contact Deborah Kerwood at 740-301-4344.